The Illusionist (written on a card): Magicians do not exist. It can’t be easy to be an aging magician, especially one who has to work so tirelessly just to get by. 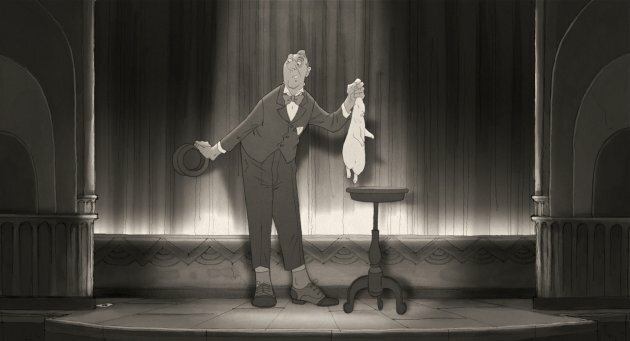 The title character in French director, Sylvain Chomet’s latest work of pure artistry, THE ILLUSIONIST, can fit his entire life into a few, tiny pieces of luggage, which he carts from one dilapidated theatre to the next, so that he can play to near empty houses whenever possible and at least afford lodging and a little to eat. Night after night, he performs the same tired tricks he’s been peddling for years, still trying to trick the world into thinking that magic can happen, when its clear from his sullen expression that he stopped believing in magic long before. It’s no wonder really that the curtain doesn’t even open for him when we first catch his act. 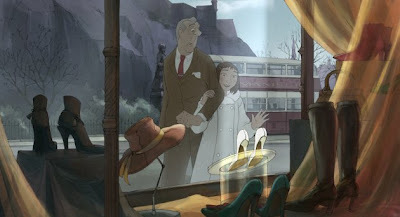 One day, a gig brings the illusionist (voiced by Jean-Claude Donda) to Scotland, where he meets Alice (Eilidh Rankin), a young girl who works at a local inn. She catches his act and then catches him backstage for a private encore and with that, she is convinced. Suddenly, there is someone standing in front of him who believes he is actually magical. From this point on, he becomes an illusionist of a different sort, trying to maintain her beliefs and mask his own true reasons for wanting her in his life. It isn’t clear whether he has ever had a daughter but it is clear from the way he takes care of Alice, that love has been absent for some time. Together, they get a small place at the Little Joe Hotel, which houses a variety of starving artists, from a suicidal clown to an alcoholic ventriloquist. For Alice, the whole situation is bigger than anything she’s ever known and cannot see how truly hard it is to keep up with. For her, nickels really can be found behind her ear whenever she needs them. 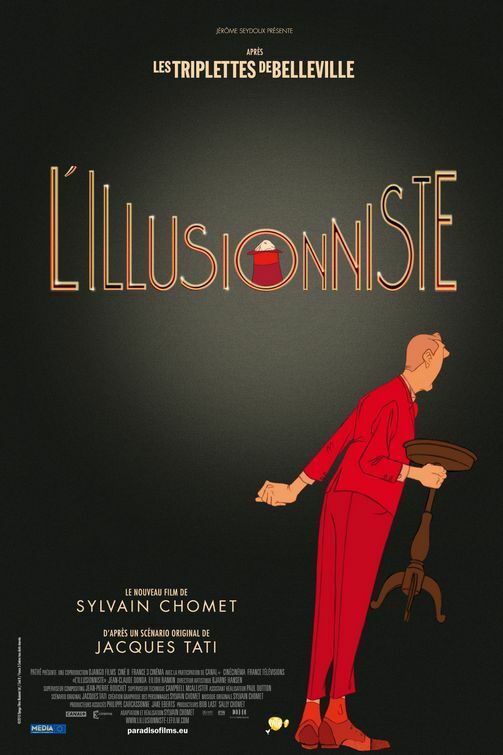 THE ILLUSIONIST is based on an unproduced script by French mime and comedy legend, Jacques Tati. It is said to be a letter to his daughter but there is some disagreement amongst admirers of his work, as to whether it was written for the daughter he barely saw or the daughter he never knew. Chomet certainly fills his adaptation with plenty of parental woe and disappointment but also rounds it out with complex issues like mixing art and commerce and the evolution of taste as it descends the generations. Like his last great accomplishment, LES TRIPLETTES DE BELLEVILLE, Chomet works a little magic of his own, creating mostly two-dimensional art that comes to life without having to rely on effects or even silly dialogue as the film is mostly silent. So without having to resort to its own form of trickery, THE ILLUSIONIST is a truly unique and enchanting experience, which should have all who see it believing in magic by the time the curtain closes.